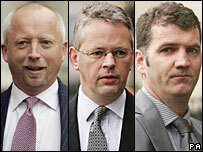 Prime Minister Tony Blair has promised to try to help three UK bankers get bail while they await trial in the US. But he rejected criticism of the new extradition rules under which the men are due to be flown to the US to face charges relating to Enron's collapse. The three men deny guilt. Lib Dem leader Sir Menzies Campbell told MPs the law was unfair as the US had not yet ratified the treaty. The prime minister denied the US was getting "preferential treatment". Laws passed in 2003 mean the US no longer has to present a "prima facie" case when asking for somebody to be extradited. NatWest executives David Bermingham, Gary Mulgrew and Giles Darby have lost their court battles to stop their extradition. They deny the charges and say they should be put on trial in the UK. Mr Blair said he understood the concerns of the bankers' families. He said he was asking his officials to see whether "any support or reassurance" could be given to help those extradited get the chance of bail. Critics of the extradition process say Britons are usually deemed to be fugitives and automatically refused bail. It is harder for suspects to prepare their defence case in complicated cases if they are behind bars, they say. Those critics have been joined by a number of high-profile business figures and Conservative Party politicians who have written to the Daily Telegraph expressing their concerns. Retail tycoon Philip Green, ex-head of Vodafone Chris Gent, and Martin Broughton, chairman of British Airways, were among the 39 signatories, as well as Tory home affairs spokesman David Davis and Alan Duncan, shadow trade and industry spokesman. Sir Menzies believes the 2003 Extradition Act is one-sided because the US Senate has not ratified the American side of the treaty. "What could be more unfair than for a British citizen to be extradited to the United States without a prima facie case and under a treaty which the United States declines to ratify," he said. But Mr Blair said it was not true the US evidence rules for extradition were different. The US demanded "probable cause" when considering whether to extradite American citizens, he said. That was very similar to the rules required from Britain under the new laws, he argued. America had just been put on the same footing as most European countries, Australia, New Zealand and Canada, added Mr Blair. Are the extradition laws fair?